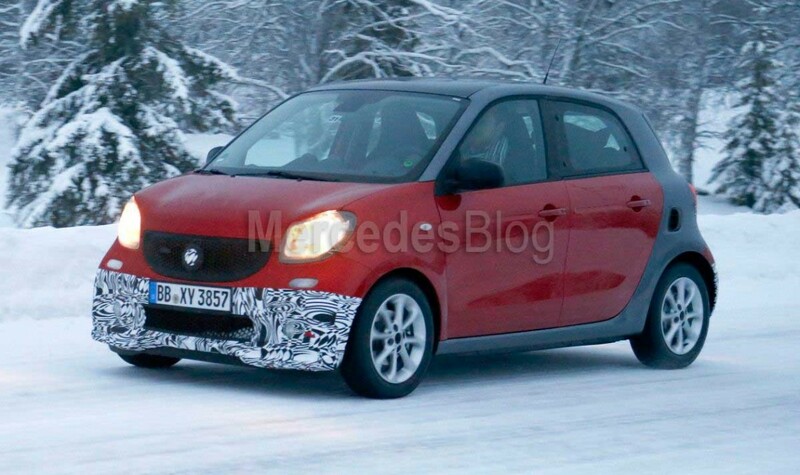 The Brabus-tuned smart fortwo cabriolet and the forfour were caught testing in the winter cold months ago, but they have kept a low profile ever since. Now the silence is over: the tiniest tuned cabriolet and the urban joy forfour are on their way to China, for their world premiere. Mercedes-Benz disclosed the secret, posting a tease-video to give us the first glimpse of the car set to be revealed next week. The kid-car that saw the light of day in the autumn of 2014 will get enhanced looks to make it not more fierce, but cuter. And a significant power boost estimated to fall somewhere between 110 and 130 HP from its 1.0-liter 3-cylinder turbo engine. Yeah, still very far from your usual Brabus beast, but the dimensions are just as far. The smart fortwo cabriolet with the Brabus touch was exhibited in Geneva, but there was no work on the engine back then. Check out how the tuning company made the tiny car look back than: Baby blue smart fortwo cabriolet gets the Brabus touch. The cherry-red Brabus-tuned smart fortwo cabriolet is on its way to China, where the long wheelbase E-Class will also mark its world premiere next week! Stay tuned! Craziest drag race. How did a Mercedes-AMG GT R got beaten by a Renault Twizy? Mr. Bean driving an AMG – This is no comedy!